Slogan: The marvelous Buddha Chinnarat, the birthplace of King Naresuan the Great , houseboats on the two banks of the Nan, delicious dried bananas, enchanting caves and waterfalls. Apart from its exceptional natural charisma, Phitsanulok provides visitors with an opportunity to explore notable chapters of Thailand is history. For example, Phitsanulok contains evidence of an ancient community dating back between 2,000 and 4,000 years, including ancient stone axes. In addition, the old temple of Wat Chula Mani, situated 5 kilometers south of the city, was built even before the Sukhothai Kingdom came to power in the 12th century. Once named Song Khwae, meaning two rivers, Phitsanulok is situated between the Nan and Khwae Noi Rivers, which is also a strategic location between Thailand’s central plains, northern mountains, and northeastern plateau. Phitsanulok is therefore a natural hub and an ideal base for travelers wishing to explore the lower North and western Northeast. 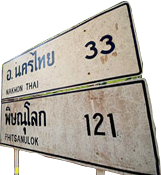 However, Phitsanulok is more than just a stopover for tourists. it is a province with a number of tourism opportunities. While most of Phitsanulok is terrain is flatlands, one third of the area is covered by mountains in the north and east, where national parks and waterfalls await exploration.